Find out more about the all-new 2019 Honda Pilot, soon to arrive at your Spinelli Honda dealer near Downtown Montreal! If you are looking for a versatile and sturdy SUV with a sterling reputation of reliability, opt for the all-new 2019 Honda Pilot, soon available at Spinelli Honda close to Laval and Downtown Montreal! This Honda SUV with multiple advantages will fulfill the needs of today’s families by combining space, technologies and energy-efficiency. Be sure not to miss its arrival and be one of the firsts to try it at your Honda dealer close to Île Perrot and Vaudreuil! Able to accommodate 7 or 8 occupants depending on the chosen version, the 2019 Pilot provides all the room you need and this, as much for your passengers as for their luggage. Indeed, while the rear trunk has a loading capacity that varies between 510 and 524 litres, by folding down the rear backseat, you will get 1,583, and an impressive 3,092 litres behind the first row of seats. Whether you are searching for a vehicle to bring along your large family or to enjoy your favorite sports in any season, the Pilot will be a tremendous ally! The sturdy and stylish looks of the 2019 Pilot contribute to make it an attractive SUV in many ways. Its LED lighting (daytime running lights, taillights and fog lights), its athletic lines, its muscular hood, its wheels ranging from 18 to 20 inches as well as its variety of modern colours make it irresistible; how about that? You will also be delighted by its roomy and comfortable interior providing a great number of commodities, such as a remote engine starter, a driver seat with 10-way power adjustment, an audio system of between 264 to 600 watts, Apple CarPlay/Google Android Auto compatibility, a navigation system, heated seats in the first two rows and so much more. The 2019 Pilot relies on the same well-proven and capable 3.5-litre V6 engine with 280 horsepower than its previous iteration. This powertrain also comes with the Variable Cylinder Management system, which gives you a very acceptable fuel consumption of 9.3 L/100 km on the highway. Even more, it will enable you to tow between 1,588 and 2,268 kg, i.e. 3,500 to 5,000 pounds. 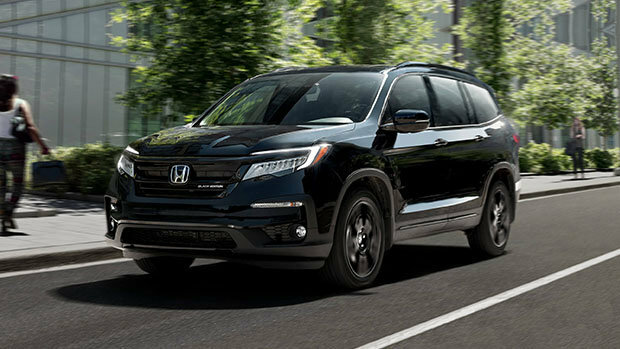 Do you want to find out more about the all-new 2019 Honda Pilot and about our current Honda promotions as well as benefit from our Honda financing options? Come see us today at Spinelli Honda! We are located in Montreal, not far from Laval, Vaudreuil and Île Perrot.